UMP | University of Minnesota Press Blog: Algonquins' struggle for land, coexistence builds as Canada's 150th approaches. Algonquins' struggle for land, coexistence builds as Canada's 150th approaches. If Canadians want to understand why some First Nations are sitting out the Canada 150 celebrations, they need look no further than to fifteen community members who took an eight-hour drive from Barriere Lake in Quebec to Toronto on Thursday. The Algonquins attended the Annual General Meeting (AGM) of the Copper One mining company to let them know there will be no mining on their territory. They have repeatedly, unequivocally, over the course of six years, notified Copper One that they intend to protect the headwaters of the powerful Ottawa and Gatineau Rivers and the affected lifeworlds of ecosystems and communities downstream. They were not even permitted to read a statement at the AGM. They were bullied, assaulted, threatened with arrest by police, accused of trespassing, and met with a thick line of “legal counsel” and security blocking their entrance into the meeting. The wonder of it all was the spirit of determination that remained undiminished and even galvanized by Barriere Lake in the face of the junior mining company’s obviously threatened response. Barriere Lake have witnessed the anguish of other communities whose lands have been affected by mining, including the Secwepemc since the Mount Polley disaster who witnessed the largest tailing pond spill in Canadian history poison hundreds of river systems in their interior BC territory a few years ago. Prime Minister Trudeau rode a wave of Indigenous support into power, promising for one thing to implement the United Nation Declaration on the Rights of Indigenous Peoples (UNDRIP), to which Canada is a signatory. UNDRIP protects Indigenous peoples’ right to free, prior, and informed consent. But these promises have unspooled in a familiar way. But Canada’s assertion of sovereignty did not extinguish Indigenous peoples’ responsibility to the lands they had been occupying for thousands of years, nor their structures of governance, nor their decision-making authority that did not derive from a foreign power, but from the responsibilities passed down for generations from their ancestors. The Algonquins have an encyclopedic knowledge of their territory. Their forest management includes food, beverage, medicine, utility, craftwork, ritual, ceremony, and commercial uses, and involves the use of mammals, birds, insects, inanimate objects, fish, flora, and fauna. For example, they know which trees are good for snowshoes and baskets, which fish make the best glue, which insects indicate the best time to hunt sturgeon along the lakeshore. At least 104 plants have been used by the Algonquins for medicine that treats everything from kidney and urinary ailments, including medicines specifically for women to deal with menstruation and childbirth, as well as for treating cancer and diabetes. It is this knowledge, the Algonquins maintain, and their protection of it, that is the source of their jurisdiction. Barriere Lake’s vision of co-existence offers a solution to the problem of conflicting Indigenous and Canadian laws. But instead, the governments maligned the community and squirmed out of their obligations. The worst of this treatment involved the destruction of Barriere Lake’s customary governance system in 2010 by ministerial authority of an archaic clause of the Indian Act that had rarely been exercised in almost one hundred years. On July 1, what will Canadians be celebrating? To live here proudly, we need to respect the Indigenous governance structures that are tied profoundly to the future viability of these lands. This piece originally appeared on The Media Co-op. 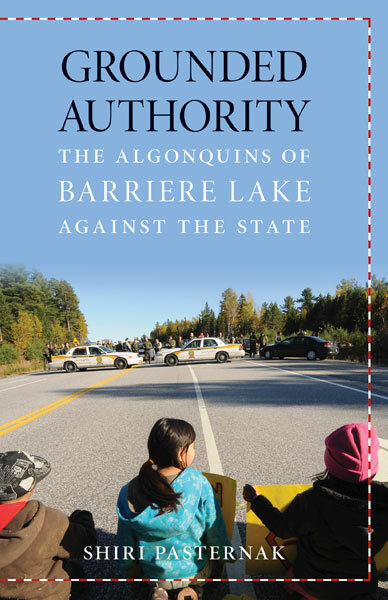 Shiri Pasternak is author of Grounded Authority: The Algonquins of Barriere Lake against the State. She is assistant professor in the School for the Study of Canada at Trent University. She has held postdoctoral fellowships at the Osgoode Hall Law School at York University and at Columbia University’s Department of Middle Eastern, South Asian, and African Studies.